An important element of a successful human relationship is trust. Trust is knowing the other person cares, is reliable, responsible, honest and dependable. This is underpinned by the belief that this person would always act in your best interest. Trust breeds respect and ensures the sustainability of the relationship. The same principle of trust applies to institutions, both public and private. The public needs to trust them to act with integrity and with their best interests in mind. According to the 2017 Edelman Trust Barometer global annual study, trust is at the heart of an individual’s relationship with an institution and, by association its leadership. The success of an institution depends on trust and positive relationships. It is therefore important for institutions such as media, business, government and non-governmental organisations (NGOs) to ensure they keep and sustain trust with their stakeholders. Why Is Trust In Institutions Important? Trust is the foundation of a healthy and lasting relationship between the public and an institution. Trust enhances relationships such as commitment, motivation and can help an institution boost its credibility. Trust is the backbone of a successful business and could give business a competitive advantage. For businesses it could mean more sales, profits and turnover. For government, trust legitimises its actions and is important for the success of its programmes to improve the lives of people. This institution depends on the cooperation of citizens to implement its vision and policies. Trust is a good indicator of public confidence, social stability and the preparedness of citizens to listen to, absorb, understand, agree and even support government communication. Trust further increases the confidence of investors, both local and international to invest in that particular country. The breakdown of trust could have dire consequences. The moment an institution loses trust, its chances of success diminishes significantly. The public loses faith in it and its leaders. Without trust, citizens become negative about their political system, their future and it can even unravel social cohesion. The Edelman Trust Barometer, which has been tracking trust in institutions for the past 17 years, shows that trust in all institutions continues to decline all over the world. 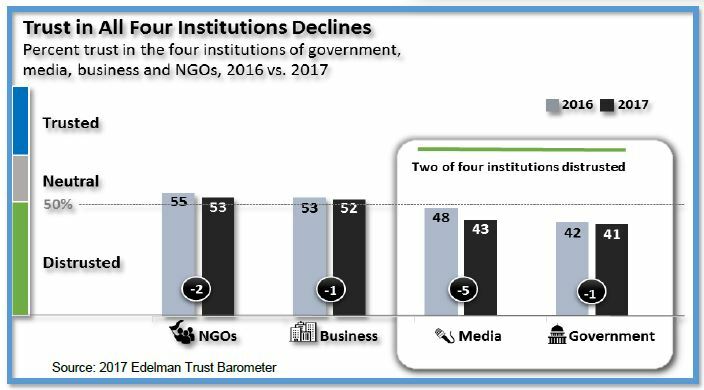 The 2017 edition presented a bleak picture of declining trust in four institutions, namely NGOs, business, media and government. 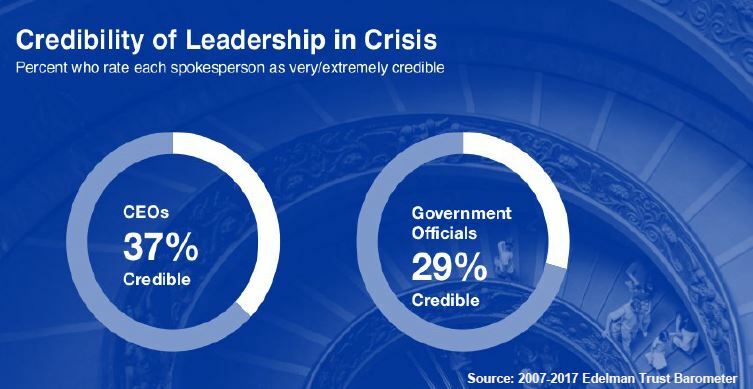 The study, which sampled 33 000 people in 28 countries via an online survey, revealed that the credibility of leaders globally is at an all-time low. It shows that South Africa is not immune from countries where people lose trust in institutions. In addition it demonstrates for instance that CEOs are perceived not credible in 23 countries out of 28. Only 37 percent believe CEOs are credible while 29 percent said the same about government officials. According to the study, trust in NGOs has fallen to nearly the same level as trust in business. NGOs and business were in the neutral category with 53 per cent and 52 per cent respectively. Out of the 28 countries, 13 distrust business. Findings show media are distrusted in 82 per cent of the countries sampled. Trust in media fell to 43 per cent and was at an all-time low in 17 countries. Trust in government stood at 41 per cent and it was the least trusted institution in half of the 28 countries surveyed. The study further found that 53 per cent believed the system was failing them, 32 per cent were uncertain while 15 per cent said it was working. In France for instance 72 per cent of people have lost faith in the system, Italy (72 per cent), Mexico (67 per cent), South Africa (67 per cent) and Spain (67 per cent). South Africa is amongst countries with respondents that indicated multiple fears on issues and where they believe the system is failing them. The 2017 edition shows that issues people are mostly concerned about are corruption, globalisation, eroding social values, immigration and the pace of innovation. Looking at the recent country report from the global study where about 1 150 respondents participated in South Africa, 56 per cent trust business compared to 60 per cent last year. It showed that 15 per cent trust government, 39 per cent media and 58 per cent NGOs. The trend of declining trust in South African institutions is echoed by Ipsos research findings. The 2014 Ipsos survey showed that the overall trust in the judiciary, media, business and government has been on the decline for some time. However, contrary to the Edelman findings, which showed government to be the least trusted institution, the 2014 Ipsos survey showed that trust in government was higher than in all other institutions. This difference could be attributed to the fact that the Edelman study was conducted online and only amongst 1 150 respondents. Therefore the survey was skewed in favour of people who are likely to be Cosmopolitans, Metro Mobiles and Safely Suburbans (Government Segmentation Model) as they have the highest access to online platforms. The Ipsos survey on the other hand was conducted through face to face interviews and this allowed access to men and women at all levels of society. The sample size was also 3500 and representative of the South African population. Research tells us that trust in institutions is on the steady decline. South Africa is part of the global phenomenon where trust in all institutions has been on the decline, especially since 2008; people just don’t believe what government or the media say. This leads to the citizens being cynical about those institution, in particular government. A significant number of citizens also believe the overall system is not working for them. The combination of lack of trust and the belief that the system is not working for them affects the mood of the nation. It also impacts significantly on citizens’ receptiveness to government messages. The nation’s mood has a direct bearing on receptiveness, determining how receptive audiences are to listen, understand, agree and respond to messages. Citizens are likely to disregard messaging that does not resonate directly with their concerns and have the ability to change their perception and lived experience; these are disregarded or filtered out. Acknowledge the national mood and flagging levels of trust. Deal with, and speak out on the issues that are dragging the mood and trust down. The private sector, individuals, labour and government has to be active participants in turning the situation around, restoring trust and instilling a sense of hope. At the heart of it should be the clarion call: “We have done it before, we need to pull together, help ourselves, and help each other”.